August 7, 2018 By This post may contain affiliate links. 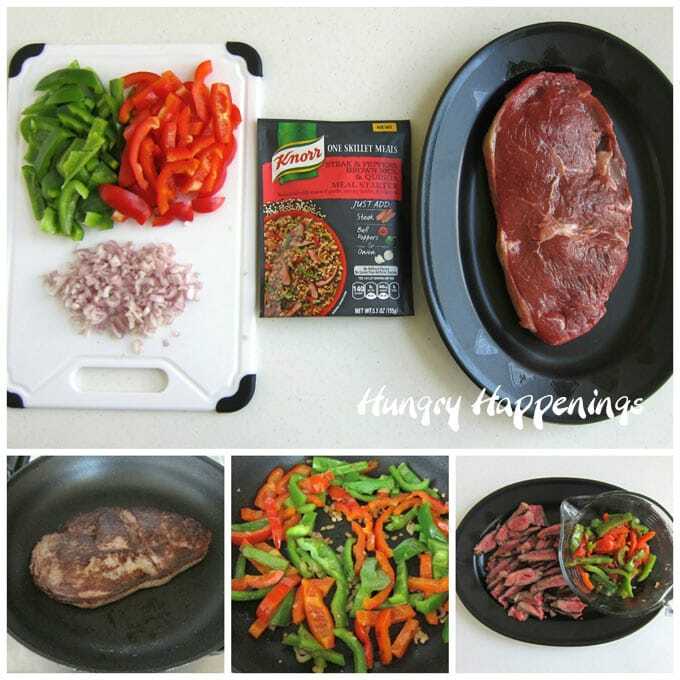 It’s so easy to prepare a hearty meal of Steak and Peppers with Brown Rice and Quinoa by starting with Knorr® One Skillet Meals. This post is sponsored by Mirum. All opinions expressed below are my own. If you are busy like me but you want to serve your family a wholesome meal that can be on the table in under 45 minutes and can be cooked in one pot, this recipe is for you. 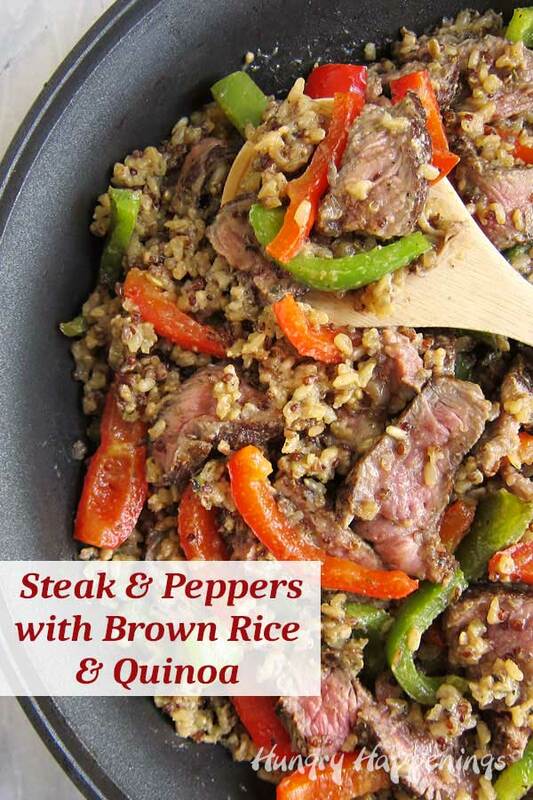 Just pick up Knorr One Skillet Meals Steak and Peppers with Brown Rice and Quinoa Meal Starter packet at Kroger while you are shopping in the rice or pasta aisle then grab a nice sirloin steak along with some onions, peppers, and olive oil and you’ll be set to make this wonderful dinner. The Knorr meal starter features responsibly grown brown rice and quinoa that is perfectly seasoned with herbs and spices which pairs brilliantly with steak, peppers, and onions. There are no artificial flavors and no colors from artificial sources in Knorr One Skillet Meals which means you can feel good about serving this dinner to your family. My husband was hesitant to try the meal once I told him it had quinoa in it, but after he took a small bite directly from the skillet, he grabbed a bowl and filled it up, sat down, and enjoyed every bite. They next day he asked me to heat up the leftovers and told me to definitely make this one-pot meal again. He enjoyed it just as much as the Lemon Chicken and Barley meal I prepared a few weeks ago, using another Knorr One Skillet Meal. The beauty of these new Knorr One Skillet Meal Starters is that you cook your entire dinner, which is loaded with protein, vegetables, and ancient grains, all in one skillet. The prep time for the Steak and Peppers with Brown Rice and Quinoa was about 15 minutes and the whole meal is ready in about 40 minutes. The package instructs you to slice a sirloin steak thinly, season with salt and pepper then cook in 1 tablespoon of olive oil in a 12-inch non-stick skillet set over medium-high heat for about 3 minutes. We like to enjoy our steak cooked rare or at the most medium rare, so I chose to cook the sirloin whole instead. That way I’d get a nice brown exterior and rare interior when I sliced it after it was cooked. I seared both sides of the steak in a hot skillet and cooked it to 130° F.
I removed the steak from the pan, tented it with tin foil and allowed it to rest while I finished prepping the meal, then sliced it just before tossing it into the skillet with the cooked brown rice and quinoa. Slice one green and one red bell pepper and slice one onion. Cook the peppers and onions in the skillet in a tablespoon of oil until tender. You may notice in the pictures, that there are no sliced onions in my skillet. I actually used a small amount of onion, which I chopped, because my husband won’t eat anything with big pieces of onion in it. Once the peppers and onions are cooked to your liking, remove them from the pan. Add one more tablespoon of olive oil along with 2 cups water and the contents of the Knorr One Skillet Meals Steak & Peppers with Brown Rice & Quinoa Meal Starter to the hot skillet. Bring it to a boil then reduce the heat and let it simmer. You’ll know the brown rice and quinoa is done when the almost all of the water has evaporated. Make sure you use a nice tight lid on your skillet and keep it on the pan for at least 20 minutes. This will keep all the steam inside and cook the ancient grains properly. The cooking time on the package states 22 minutes and I found it was perfectly cooked at that time. Toss in the slices of sirloin steak and the peppers and onions, cover the skillet, remove from the heat, and let rest for 2 minutes to heat through. Heat 1 tablespoon oil in a large, non-stick, 12-inch skillet over medium-high heat until the oil just begins to smoke. Season the sirloin steak with salt and pepper. Place in the hot skillet and cook for 2-3 minutes per side until nicely browned and the internal temperature reaches at least 130 degrees for rare and up to 160 degrees for well done. Add one tablespoons olive oil to hot skillet and toss in onion and pepper slices. Heat until tender then remove and set aside. Add the remaining 1 tablespoon of olive oil to the skillet. Then pour in the water and the contents of the Knorr One Skillet Meals packet. Cover the skillet with a tight fitting lid, reduce the heat to low, and simmer for about 22 minutes until the rice and quinoa are cooked through, and most of the liquid has evaporated. Meanwhile, cut steak into slices. 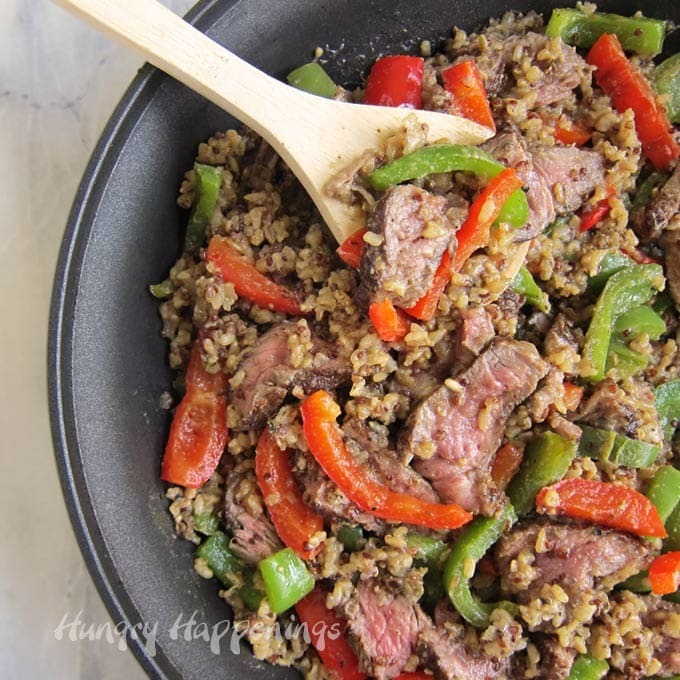 Toss steak, peppers, and onions into the skillet with the rice and quinoa. Remove the pan from the heat, cover, and let rest for 2 minutes. Once the steak and peppers have heated through, remove the lid and serve directly from the skillet. 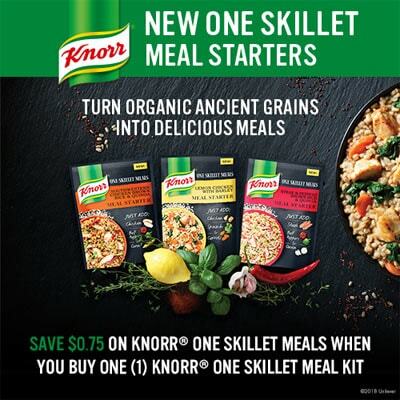 I can’t wait to try the other Knorr One Skillet Meal Starters including Moroccan Style Chicken with Barley, Shrimp Scampi Whole Wheat Couscous, and Southwestern Chicken Brown Rice and Quinoa. 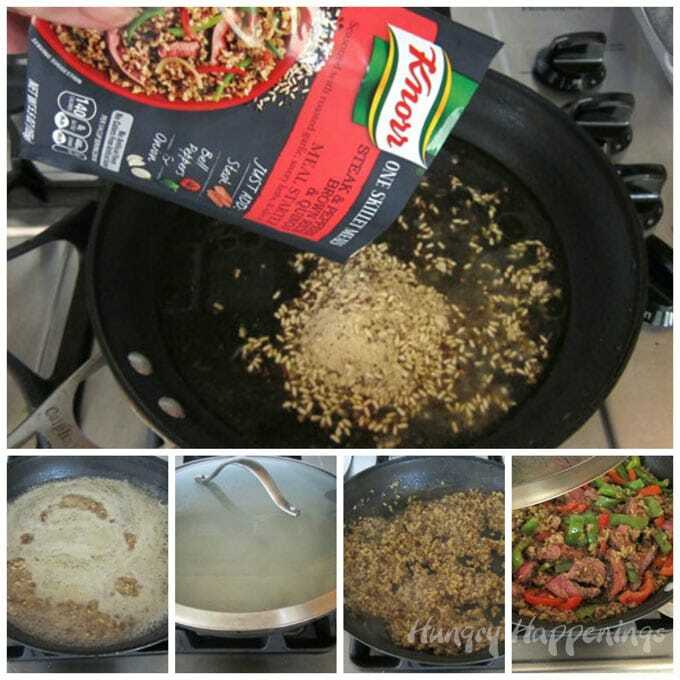 You can find Knorr One Skillet Meal Starters in the rice or pasta aisle at any of the Kroger brand stores. If you don’t live near a Kroger, be sure to check out the product locator on the Knorr website for product availability in your area. 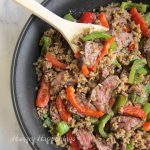 I hope you enjoy making this Steak and Peppers with Brown Rice and Quinoa one pan meal for your family. If you try this or any of the other Knorr One Skillet Meal Starts, I’d love to hear what you think in the comments below. I was compensated for sharing this post with you, but all the opinions expressed within this article are my own. Be sure to check out my other everyday meal ideas, here. Such a great dinner recipe! I bet adding the Knorr mix really kicks up the flavor! It is awesome and so easy to make! I love Knorr mixes and bet this could be a favorite! We enjoy this meal again last night. It will definitely become a staple in our house. I didn’t know that Knorr has a new product. Thank you for sharing! The dish looks so great! This is a meal my family and I can appreciate. This dish will be on our table this week. Thanks for sharing THS yummy looking meal. I hope you and your family enjoy this dinner. I’ve made it a few times already and we really love it! It is definitely finger licking good!